Agnolotti, ravioli’s cuter cousin, hails from the piedmont region of Italy. These delicious pockets are filled with a mixture of ricotta, Romano cheese, and butternut squash. 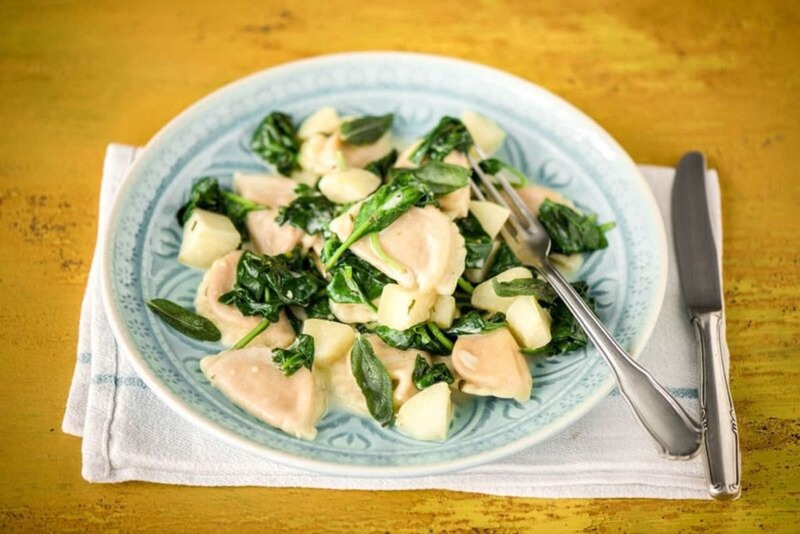 Tossed with tender apple, earthy sage, and a touch of spinach for good measure, this is the ultimate winter comfort food. 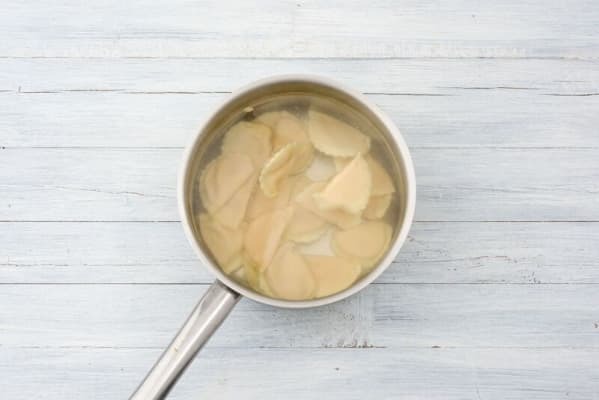 Cook the agnolotti: Bring a large pot of water with a large pinch of salt to a boil. Once boiling, add the agnolotti and cook for 4-5 minutes, until tender and floating to the top of the water. Drain, reserving 1/2 cup pasta water. 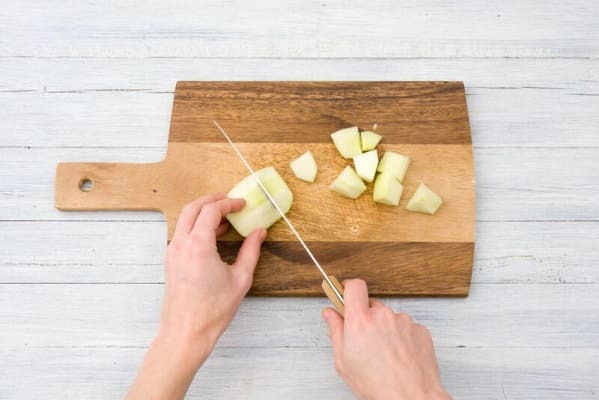 Prep the ingredients: While waiting for the water to boil, peel, core, and dice the apple into ½-inch cubes. Mince or grate the garlic. Finely chop 2 teaspoons of sage leaves. Heat 2 Tablespoon butter in a medium pan over medium heat. 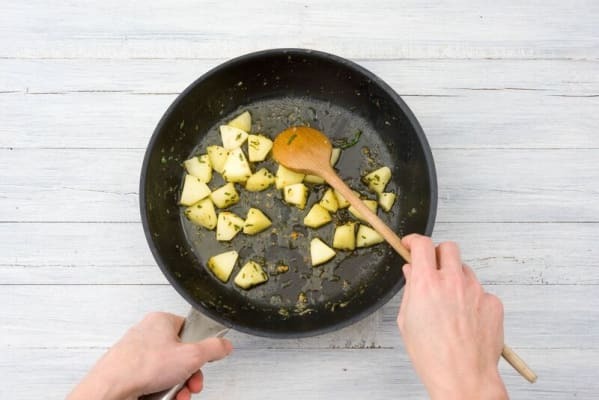 Add the apples, chopped sage, and garlic to the pan and cook, tossing, until the butter begins to turn a speckled golden brown. Quickly add ½ cup pasta water (careful, it will sputter!) and the vegetable stock concentrate the pan. Cook, tossing, until the apples are just barely tender and the stock has thickened, for 2-3 more minutes. Season with salt and pepper. Add the spinach to the pan, working in batches if necessary. 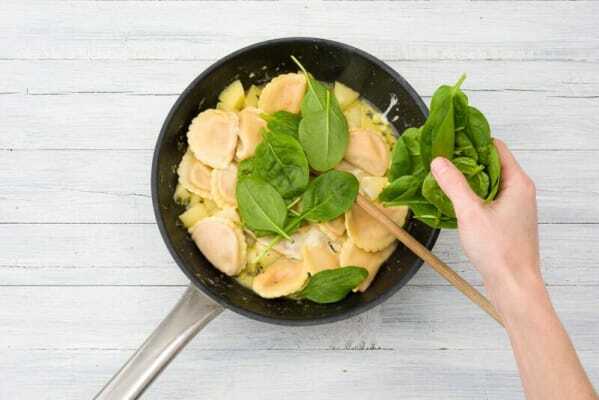 Cook, tossing carefully, for 3-4 minutes, until the spinach has wilted and a thick sauce has formed. Carefully toss the sour cream and drained agnolotti into the pan. Taste and season with salt and pepper. HINT: Add a splash of water or pat of butter if the sauce becomes too thick. Plate: Serve the agnolotti divided between bowls and enjoy!